“What am I being right now?” the voice in my head wondered. “Sitting. I am sitting,” I answered it. It was at this moment that I realized that there is no definitive answer. I am faced with a blank slate. This moment, and every other moment I can be whatever I want. I can be whatever I want! Still looking around me, I felt like I was noticing my surroundings with brand new eyes. The sharp edges of the room, the quiet, warm, calm environment, my clothes tucked away in the closet, a room next door devoted to creating art, food in the fridge in the kitchen, my family and friends a phone call away…all of this and more flashed through my mind like a scene from a movie. I felt like I was physically struck by a joyous arrow. The gush of emotion was for once unfiltered and unresisted as it caught me planted squarely in the present moment. “I am being grateful,” I decided, through the buzz. I believe my latest painting comes as a result of this experience, my first conscious act of being. The setting is dawn, my favourite time of day. The sky is awakening and the morning mist is still heavy among the trees. Just as I was, this wolf is planted firmly in the moment and is being. 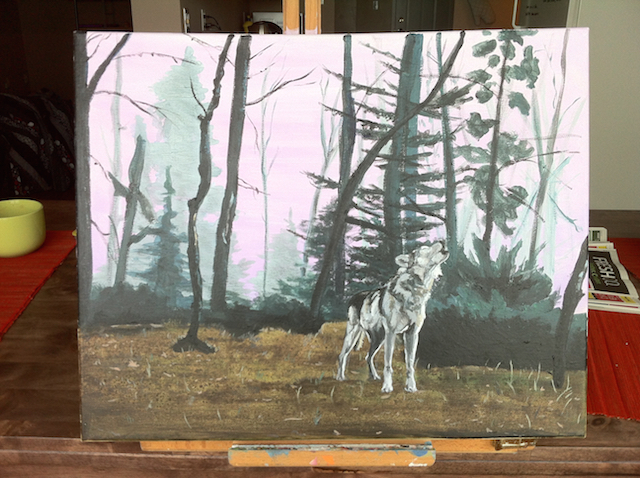 This is one of the first times I included any sort of landscape with my wolf, and I enjoyed using new techniques, particularly the use of salt in the foreground while the paint was drying. I think it gives the foreground a bit of unforced texture, detail, and depth of colour. Of course my favourite part was first sketching out, and then filling in the wolf! This piece won’t be for sale for some time (I can’t stop staring at it), but it will definitely be available as a print soon. Check back in the coming weeks for details! As I went through this past week in gratitude, I realized how much I think about my gratitude, and how much I talk about it to myself. This is great, but boring and lifeless. First comes being, then comes…behaving? And then, weaving in to form the backdrop of it all, there is the matter of what am I becoming? ?